Who your incoming links are. How many total pages they are linking to. However, in the third factor we have a problem. What happens when I link to your page and you link to mine? Then I need your PageRank to calculate mine, but you must know mine to calculate yours. The calculation seems to break down. After further thought, the problem becomes applicable not only to link exchanges–but to the entire Internet. The whole World Wide Web is interconnected, but how can everyone’s PageRank be based on everyone else’s? Let’s start with a simple model. Let us assume we have only two pages in our World Wide Web. Page 1 Links to Page 2, and Page 2 links to Page 1. Since we don’t know the PageRank of either page yet, we guess. We can guess anything, the numbers will still turn out the same. (Try it if you don’t believe it.) So, we’ll use an easy number for a starting PageRank. We choose 2. We can see these numbers seem to be nearing a PageRank of one for both pages. And, eventually, after a few more iterations the PageRank does settle at one for the final PageRank for both of our web pages. (The PageRank numbers never actually stop changing, but the changes become so small as to be insignificant.) So eventually…. 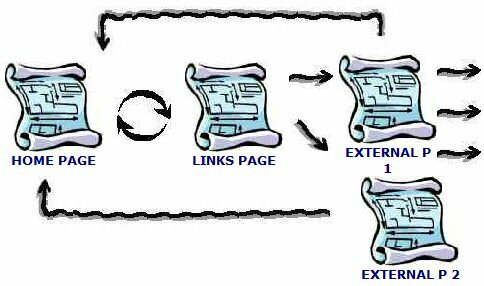 So, in a simple two page model, where each page links to the other, both pages will have a PageRank of one. This time let’s start by giving everyone a PageRank of 1. After 40 iterations we get…. There are a few important things to note here. Even though the Home Page has more incoming links, it has a lower PageRank than the Links Page. This is because although it has two votes–one from External Page 2 and one from the Links Page–they don’t provide much PageRank. The vote from External P 2 is worth only .34–and the vote from the Links Page is worth only .69/3 or .23 because its total vote has been divided up between 3 pages. The Links Page, on the other hand has one vote from the Home Page which gives it its full vote of .64. So the Links Page ends up with more PageRank! External Page 1 and External Page 2 have the same PageRank, even though External Page 2 has an outgoing link and External Page 1 does not. This is because PageRank is determined ONLY by incoming links. However, outgoing links are still a drain on your pages PageRank. How can that be? The drain is an indirect effect. In this case, the Links Page is the culprit. It divides up it’s vote between three pages. Two of these votes are going to external pages and are not being kept within your site. 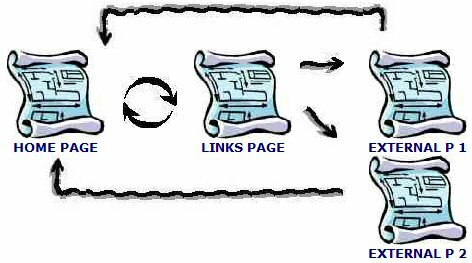 Therefore, the Links Page has less to give to your site and your sites PageRank suffers. In this model our site actually did better when we had no incoming or outgoing links at all! So, is the answer not to have a Links Page? Let’s look at what happens when External Page 1 returns the link that we gave it. That one backlink really helped us out! Not only that, but the backlink increased the PageRank we provided to our External Links as well. How is that possible? Simple. When the Home Page got more votes, it was able to give a stronger vote to the Links Page who in turn was able to give stronger votes to the External Pages. So, this model is obviously better for everyone. Well, as soon as External Page 1 starts sharing his vote among his own pages, the value of our backlink decreases significantly. Still, we’re better off than in the first example when our Home Page PageRank was .64. So…will a link exchange with External P 1 ever be a bad thing? It can be. So far we have assumed that all our pages start out with the same PageRank. But what happens if we already have a strong PageRank? We have given our Home Page some backlinks. To keep the calculations simple, we are assuming that each one of these 100 backlinks is a dedicated link of PR 1. Running through the calculations, after a few iterations we get…. That looks pretty good. But what would have happened if we hadn’t swapped links? So, exchanging a link with this site was a bad thing! Play with the results yourself. Try our Link Value Calculator. Sean Odom is the founder of SeOpt Internet Marketing, a local SEO in Houston. Sean is also co-founder of Socialot.com, a social contact management system for small businesses.